During my last article, we learned about growing through perseverance. Seasons of the “pause button” can work in us peace, pruning, peace and preparation for later seasons. God does deep heart surgery in our hearts at this time. We can turn these times into times of worship. We also learned during an earlier article of the peculiar combination of suffering and joy. God’s grace is such that he empowers us with joy as we trust him in very difficult circumstances. This isn’t just about the refiner’s fire of life – it’s about living a victorious life despite suffering. Examples of people who do this include Heidi and Rolland Baker, Supresa Sithole and more. They also live a life of worship in the midst. They are grateful for all God does in their lives and ministry. They praise God often. Some people call pause seasons time in the desert. I’ve spoken about this as well. Deserts can be even more refining than regular waiting seasons, but they are necessary to refine us. This is when we learn to let God refine us from the fear that holds us back, like Hannah Hurnard’s character called “Much Afraid” in her book Hinds Feet in High Places. The desert can transform the image we have of ourselves as well as our image of God. These false images we stored in our hearts are shattered in the desert. Once they are destroyed, we can then see and discover what is real about God. We are transformed as we journey on in four unique desert gifts: spiritual transformation, psychological change, a new role and a new future. That transformation can take further seasons in the desert for pause and reflection. I shared about this in an earlier broadcast about persevering what I called seasons of the “pause button.” Yet even in seasons where we are gladly busy and moving along, we have disappointments. Some of these are small, and some are deep. In the midst of the waiting, or the pause, as I like to call it, is an opportunity to assess and remember God’s faithfulness. Iris base leader Surprise Sithole has endured much persecution and trauma in his life, yet he is always filled with joy. Every day can be a good day. His attitude towards pausing is that waiting on God is worship. I recently read Philip Yancey’s book Disappointment with God. He deals with our human view of personal disappointment and suffering, and then God’s view through Father, Son and Holy Spirit. He shares that three questions surface in human suffering. These are: Where is God? Why is God silent? And Why is life unfair? Sometimes it seems like God is absent in the midst of pain and darkness. This especially is shown in the middle chapters of the book of Job, although the first chapter and last chapters reveal that God had been there all along. The story had a good ending. The Old Testament showed God the Father as so holy that he was nearly unapproachable in the temple, and showed himself in a burning bush and other miracles. While he is invisible, he made himself clearly known. However, most of the people cowered in fear so most did not seek him out, which was his deepest desire. His love was rejected except for the prophets and David, who was known as a man after God’s own heart. When the Israelites turned away in sin and worshipped idols, it broke God’s heart like a spurned lover. It was the Israelite’s way, and later the Pharisee’s way to demand signs, and miracles. And yet their hearts did not come close to the God of miracles. God doesn’t like to be put to the test. Listen to Mark chapter 8. Even Jesus response towards the demand for a sign showed his disappointment “When he heard [the Pharisees’ request], he sighed deeply in his spirit and said, “Why do these people keep demanding a miraculous sign? I tell you the truth, I will not give this generation any such sign.” So he got back into the boat and left them, and he crossed to the other side of the lake.” Miracles may catch our attention, but it is love that changes hearts. While there is a place for not rushing the process of genuine grief, self-pity can keep you stuck for weeks, months and even years. Leanne Payne called this ‘descending into the hell of self,’ which essentially makes you your own worst enemy. I know this personally, since I often fell into this mode of thought. My Australian friend Jan went with me to experience a Leanne Payne Pastoral Care Ministry School in Wheaton. I received deep emotional healing for past abuse, and the beginning of healing for crushed will issues. Yet one part of my healing was to lift off a cloak of shame and self-pity. Even though I had a larger degree of freedom, I had to choose to walk as a free person. We develop habits and coping skills that are based on lies we believe about ourselves, our environment and God. When we deal with these, and also form healthier habits, we maintain our freedom. Pause: So we pause and reflect. The Russian Christians have a wonderful attitude of pausing in a retreat. That’s not a retreat that goes backwards, but a retreat to spend time with God. They call this cabin in the woods a poustinia, where they seek God in silence and solitude. Jesus also often went to solitary places to pray and spend time with the Father. We need to do this as well. This is when we can come to Jesus with our broken hearts and disappointments. He is still with us and cares. Don’t harbour it in your heart and get bitter. Stop going around in circles in the desert of disappointment. I had a friend who did this. Let’s say his name is Jack. Jack became bitter and continually railed against God because he wanted a wife. He fell in love with another friend of mine, who was in love with two men – Jack and Ted. She finally decided for Ted, rather than Jack. I don’t think Jack ever got over it. And so Jack stayed in his disappointment and did not move on, until just recently. He made an announcement on Facebook that he just got married, but gave no details. At least I hope he’s happy. Ponder: Once we stop and pause, look up and ponder. Look all around you. Are you still under that rain cloud? Or are you ready for a second touch from God? Jesus is with us. Our Afrikaans pastor Johan shared about God’s second touch, through the Gospel of Mark, chapter 8. Let’s take a look at that chapter. Jesus had encountered blind men several times in his ministry. One of the times is written about in the Gospel of Mark, chapter 8. It was the time that Jesus made a mud poultice to put on the blind man’s eyes. The man had to be prayed over more than once. The first touch restored the man’s sight, but he could only see in a very blurry way. People looked to him like trees. This showed that even Jesus sometimes had to give a second touch for healing prayer. Healing has come, but not in its fullness. Johan shared that we should content that God has touched us in the past, but not satisfied with mediocrity. So let’s turn the disappointment around. Yes, there is a need. Just think – Jesus didn’t want that man to be stuck in limbo. In his case, the second touch came right away, and Jesus prayed again. Often that completion of healing comes later on. Johan told us prophetically that we may be satisfied with a little touch, but God actually isn’t. He has a second touch coming our way. Since he is the one who gave us saving faith, he is the one who will complete us in all ways. God did not create us to have half of our destinies. So while we pause, ponder and consider all our little blessings. While you are counting them, he just may surprise you with what you need. The Apostle Paul reminds us in Colossians 3:15 to “let the peace of Christ rule in your hearts, to which indeed you were called in one body; and be thankful.” May you fill us with that peace, Lord as we ponder you. Praise: Once we know that we can trust God, we can take time and praise him. We thank him take the focus off of ourselves. We were never in control anyway – it was always just an illusion. It can be difficult to be thankful, but if you make a habit of it, your eyes will open at all the little blessings in your life. Here’s an example of what praise and thanksgiving can do in scripture. In Acts 16, Paul and Silas were on a mission trip in Philippi, Greece. Paul got annoyed by a girl who was demonized, because the spirit drew attention to itself. After the girl was delivered, her owners were angry that the girl could no longer tell fortunes. This had an effect on their finances. So they reported them to the authorities with lies, and they were publicly beaten and thrown into prison. “The jailer was ordered to make sure they didn’t escape. 24 So the jailer put them into the inner dungeon and clamped their feet in the stocks. Around midnight Paul and Silas were praying and singing hymns to God, and the other prisoners were listening. 26 Suddenly, there was a massive earthquake, and the prison was shaken to its foundations. All the doors immediately flew open, and the chains of every prisoner fell off! 27 The jailer woke up to see the prison doors wide open. He assumed the prisoners had escaped, so he drew his sword to kill himself. 28 But Paul shouted to him, “Stop! Don’t kill yourself! We are all here!” Did you notice what Paul and Silas did in the midst of being in prison? They were singing worship songs! They were praising God in the midst of their trial! I’ve heard other mission stories that are similar, although deliverance didn’t always happen that fast. 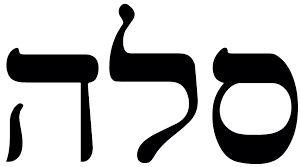 Psalming: Finally, there is another step in pausing, pondering and praising. It’s Psalming. There are 150 Psalms right in the middle of the Bible. King David was one of Psalm writers. He had a pattern of complaining to God of difficult circumstances, asked God what he was going to do about it, and poured out his heart in distress. But always at the end, he chose to trust God. Either he asked for vindication due to God being just, or he just chose to trust God in that situation. In Psalm 4, he declared that God would keep him safe so he could sleep. In Psalm 5, he declared that God was a shield of protecting love. Psalm 6 declares that God has heard David’s prayer. Psalm 7 ends in thanks, and 8 ends with praise. Psalm 13 ends with trust, David sang, “But I trust in your unfailing love. I will rejoice because you have rescued me. I will sing to the Lord because he is good to me.” And so, the pattern of complaint, praise and trust continues. My seminary professor David taught me a course called Foundations of Christian spirituality. One of the topics he shared was about writing your own psalm in difficult times. It allows one to pour out their grief and sorrow, and then offer it back to the Lord. That emotion could also show more than sorrow – there are one or two psalms in the Bible that were written in anger. If you remember reading about dashing babies against rocks, this was an example of something akin to road rage. Does God condone infanticide? Absolutely not. But he does understand anger, and you can bring whatever that is in your heart to him. Together with him, he can give you peace as you work through your feelings. It could be then that you get your second touch. So remember to pause. Look up to God, past your disappointments. He is not silent. He is with us. Then ponder. You are not forgotten. You are in the midst of a process where he is making you beautiful. And Psalm, like David. Pour out your heart to him in your own poem. Then turn it around as a declaration of trust or thanks. You’ll find that you’ll grow in the process. You might even write a song through the experience. Let me pray over you. Lord, thank you that you never leave us. I ask you to help us pause and look up to you, no matter our disappointment. A delay is not a no. Help us ponder all the wonder you’ve created around us. There is suffering but there is also beauty and joy. Help us praise and be thankful for each thing you’ve given us. And help us to psalm – to remember your loving kindness. To help us turn our perspective from the pit, to the plain, to the mountain top. You never leave us. Fill my friends with your peace. In Jesus’ name. If you’d like to hear the audio version of this talk, please visit the Ways to Grow in God podcast page on our Copples missionary website, then scroll down to Podcast 25. Last time we discovered we have a lot to be thankful for. We also found that being thankful is good for us – in our walk in faith and in our daily lives. Thankfulness grows our hearts so we can be filled with more love. When you have an expanded heart, you can experience more joy, which is also our strength (Neh. 8:10). This requires waiting, and pause for reflection. I had meant the next article to be on being grateful beyond thankful. However, I discovered there was far more involved in the area of growing in thanks. I found that this is a very deep area of our faith. It’s the underpinning of so many areas in which we grow closer to God. Thankfulness is also part of our first step of faith. Many of you came to faith in Jesus Christ through praying the “sinner’s prayer” of repentance. One simple form of that prayer is featured in Nicky Gumbel’s “Why Jesus” pamphlet that we use in the Alpha Course. Nicky highlights this prayer “can be summarized by three very simple words: Sorry. Thank you. Please.” (Sometimes when I’m on the mission field or with people asking about faith, this summary is what comes to mind). Some of you reading this article may not have faith in Jesus Christ yet, even though you have a desire to grow deeper in God. If you pray this prayer with me, and mean what you’re praying, you are now a Christian. If you prayed that prayer for the first time, welcome to the family of Christ! You are now my brother or sister. Make sure you seek out a church, and small group of Christian believers who can encourage you in your faith, pray with you, and study the Bible along with you. The Christian faith is not meant to be lived in isolation on your own, but with each other. However, if you are living in an area where Christians are persecuted, then ask God for wisdom on when to share and with whom. He will keep you close to nurture your faith, heal your heart wounds and fill you with love. He can also bring you to people who can grow with you in faith. Yet most important, God will never fail you, for he is very definitely faithful. And so, salvation is the foundation of things to be thankful for as we focus on and worship the Lord. The Apostle Paul encourages us to pause and remember all good things, which cause us to be thankful. We can also combine thankfulness with soaking prayer. If you’re new to the idea of soaking prayer, I write about it in my article from March 2013 (Slow down and let God’s love fill you). When you are filled with God’s love, you become more thankful, and consequently open to receive even more of his love. Pause and let his love fill you! And always be thankful. 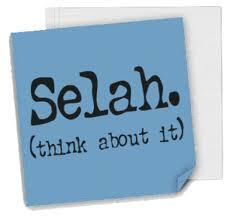 We stop again to think on the word Selah, which often appears in the Psalms (71 times as well as 3 in Habakkuk). Some writers believe it refers to a musical interlude between sections of reading Psalms. Others see it as a pause, or liturgical meditation on what the listeners have heard in the recited Psalms. 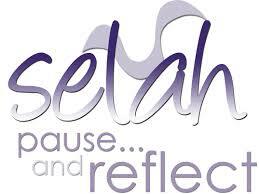 For this article, we will borrow the concept of Selah as a pause and reflection. Sometimes it is necessary to stop and remember all we are thankful for before we continue on our journey. Funerals are like that – although we are sad at the loss of our loved one, we also celebrate their life and are thankful that they were with us for the time we had them. These people were part of our life stories. Let’s continue with the idea that our lives are like stories. When we walk through difficulties and joys, these impact us and become part of our stories; part of who we are. Sometimes circumstances and pain may cause us to become stuck in grief. It is good to grieve, but it is not good to become stuck in the same emotions in an endless loop. It also is not good to become stuck from painful memories that cause us to be locked in a prison of unforgiveness. When we forgive those who hurt us, we can choose to react in a positive way. We take charge over our own story, with God’s help. We aren’t accountable for what has been done to us, but rather, for how we react. When we choose to react positively, and make a lifestyle of thankfulness, the fruit we show is sweet. We can re-story our own lives by ‘psalming.’ King David and other Psalm writers did this in the book of Psalms. Some of those Psalms start out rather angry (Read Psalm 69) but end up with praise. David cries out to the Lord with everything in his heart. He trusts that God is hearing where his heart is at; and then he turns his lament into praise and thanksgiving. Yes, he said some pretty nasty things about his enemies, but how better it is to confess that to God, then let it fester in his heart! I personally believe that God likes it when we are honest with him. He knows what is in our hearts, and is waiting for our invitation to set us free. You can write your own psalm before the Lord. It doesn’t have to be fancy. But it does need to be honest, and allow you to trust God more for the great ending. Being thankful also helps us in transition from one stage of your life to another (being phases of your physical life, or seasons of your spiritual life). We don’t always know where we are going in the midst of moving from one place to another. Sometimes we feel lost in the desert. Other times we just need a rest stop on the highway. We may feel like we’re in the middle of a storm and can’t see much beyond our circumstances. This is the time to pause and remember God. This is the time to remember all we are thankful for! Thankfulness helps keep our eyes on what God is doing. Thankfulness keeps us from keeping our eyes inward on our own circumstances. Even if you don’t hear the still small voice of the Holy Spirit right now, you will. You are still being carried towards your next destination. He is growing in you a deeper trust as you grow your heart deeper through prayers of thanks. So, while I am continuing to think of the deep connection between thankfulness and gratitude (which is to come soon), remember to pause and give thanks to God. You can fill out your thanks items on a piece of paper, on your computer, or even on your phone (I use the “Remember” application on my phone). You may be surprised what the Holy Spirit reminds you of! Have you given thanks today? Next time we will grow in gratitude as we share in the cup of Thanksgiving.